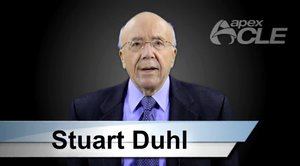 Stuart Duhl serves as a business and legal counselor to his clients. He assists business owners with a variety of tax and corporate problems, and plays a major role in planning objectives for the future of their businesses. He also represents a number of family-owned businesses and assists them with succession planning and other family business issues. In the non-profit organization area, Mr. Duhl advises clients on obtaining tax-exempt status, and setting strategic planning goals to meet charitable objectives. His business clients range in size from small, one or two person operations, to those with sales of over one hundred million dollars and include a variety of industries, including construction, real estate, multi-level sales, debt collection, retail sales, commercial cleaning, moving, technology, and food brokerage. He has also assisted companies with their business strategies in China as a former member of the executive committee of the China Alliance. Stuart has been listed in the Best Lawyers in America directory and Leading Lawyers Network. He is also an adjunct professor of law at Loyola University Law School in Chicago teaching courses in Federal Income Taxation, Corporate and Tax Ethics, and Tax Audits, Procedure and Ethics. Mr. Duhl also acts as a mediator in business disputes. Stuart is admitted to practice in Illinois and is a member of the American Bar Association, the Illinois State Bar Association, the Chicago Bar Association, and the Chicago Council of Lawyers. He is also a member of the Attorneys for Family Held Enterprises (AFHE) and the Chicago Chapter of the Association for Conflict Resolution.